2007- Art St. Urban, Lucerne, Switzerland, “In the Shadow of theAlps.” Temporary installation of the sculpture Portal. 2001 Georgia and David K. Welles Sculpture Garden, ToledoMuseum of Art, Toledo, Ohio. Permanent installation ofsculpture Continuum. 2001- DeCordova Museum and Sculpture Park, Lincoln,Massachusetts. Temporary installation of sculpture Apollo. Wichita Waterwalk, Wichita, Kansas, exterior plaza sculpture, formed and fabricated weathering steel, stainless steel and bronze, 40’ H.
2010 24th Street Bridge Project, Iowa West Foundation, Council Bluffs, Iowa, Four gateway sculptures, formed and fabricated. 50’ H.
2009 Monterrey, Mexico, Parque Fundidora, exterior sculpture, formed and fabricated polychromed steel. 100’ H.
Clay Center for the Arts and Sciences, Charleston, West Virginia, exterior sculpture. 70’ H.
2008 Jewish Community Center, Cincinnati, Ohio, exterior entrance sculpture, formed and fabricated, Stainless steel. 20’ H.
Trenton Station, Trenton, New Jersey, Zenith, freestanding exterior sculpture, formed and fabricated polychromed steel. 34’ H.
Riviera Condominiums, Fort Myers, Florida, freestanding sculpture, formed and fabricated polychromed steel. 30’ H.
Village of Hope, Orange County, California, exterior plaza sculpture, fabricated and polychromed steel, 25’ H x 12’ W x 12’ D. Plaza sculpture, formed stainless steel, 8’ H x 8’ W x 6’ D. Entrance Portal, forged and painted steel, 15’ H x 25’ W x 1.5’ D.
National Harbor, Alexandria, Virginia, exterior Eagle sculptures, formed and fabricated stainless steel. Cleveland Botanical Garden, Cleveland, Ohio. ceremonial archway. 178” H x 663” W x 38” D.
2003 Rochester Institute of Technology, Rochester, New York. Sentinel, exterior sculpture. 876” H x 360” Diameter. The Commission Project, Rochester, New York. J D Award Sculpture and Personalized J D Award Sculptures. Monahan Pacific Development Corporation, San Francisco, California. Lighting and Main Entrance Portal. Formed and fabricated stainless steel. Eastman Kodak Company, Rochester, New York. Diversity Award Sculpture and Medallions. The Toledo Museum of Art, Toledo, Ohio. Confluence, design of meeting and banquet space including sideboards, sconces, and mirrors. Formed and fabricated stainless steel. Temple Israel, Dayton, Ohio, Menorah. Formed and fabricated steel, stainless steel. 45 x 21 x 108 in. 1997 San Francisco Art Commission, California, for the Civic Center Courthouse. Exterior Entrance Doors, Rotunda Lobby Gates, Elevator Doors and ElevatorHandrail Brackets. Formed and fabricated stainless steel. The Ohio State University, Columbus, Ohio. Gnomon, exterior sculpture. Formed and fabricated weathering steel, natural patina. 235”H x 103”W x 95”D. Congregation Adath Jeshurun, Elkins Park, Pennsylvania, Flower Urns. Formed and fabricated steel, bronze. 65 x 36 in. diam. 1996 Bausch and Lomb, Rochester, New York, for the new corporate headquarters. Genesee Passage, exterior sculpture. Formed and fabricated, weathering steel. 720”H x 192”W x 144”D. San Francisco Art Commission, California, for the Civic Center Courthouse. Exterior Entrance Doors, Rotunda Lobby Gates, Elevator Doors and Elevator Handrail Brackets. Formed and fabricated stainless steel. Sony Pictures Entertainment, Culver Studios Office Building, Culver City,California. Primordial Reflections, security screens. Formed, fabricated and painted steel. 80”H x 257”W x 10”D. Temple Israel, Dayton, Ohio, Eternal Light and Menorahs. Formed and fabricated steel, polychromed. 1994 General Services Administration, Washington, D.C. for the Federal Courthouse, Camden, New Jersey. 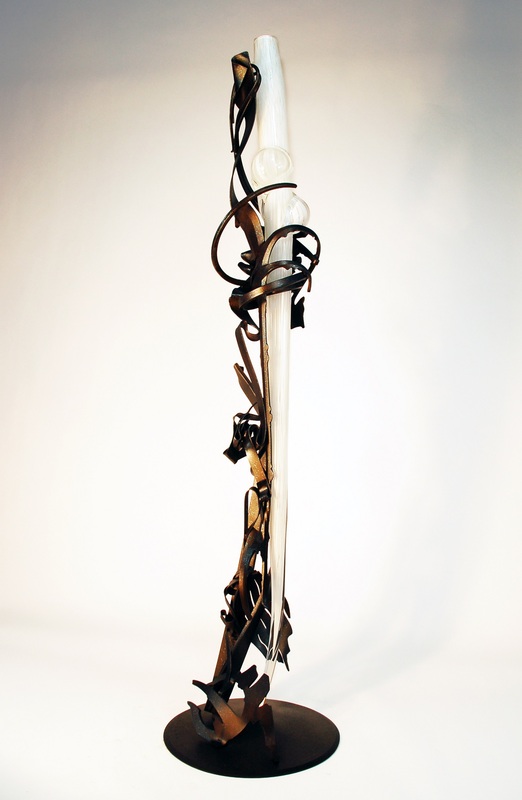 Metamorphosis, interior sculpture. Formed and fabricated steel, polychromed. 107″H x 134″W x 18″D. Temple Israel, Dayton, Ohio. Tabernacle Screen. Formed and fabricated steel, polychromed. 91.5″H x 104″W x 4″D. Architects: Hardy, Holzman &Pfeiffer, New York. Victoria & Albert Museum, London, England. Museum Bench. Fabricated steel, mahogany. 27”H x 135”W x 30”D. 1990 The Landmarks Group, Promenade Two Building, Atlanta, Georgia. Olympia, exterior sculpture. Formed and fabricated steel, polychromed. 29’H x 14’W x 8’D Architect: Thompson, Ventulett, Stainback & Associates, Inc., Atlanta, Georgia. Arts Council of Roanoke Valley, Roanoke Airport Authority. Roanoke Regional Airport, Roanoke, Virginia. Aurora, exterior sculpture. Forged and fabricated steel, polychromed. 18’H x 12’W x 6’D. Birmingham Museum of Art, Birmingham, Alabama. Confluence, exterior sculpture. Formed and fabricated Cor-Ten steel, 18’H x 10’W x 4’D. 1989 City of Rochester, New York, Main Street Redevelopment project. Bridge Railings, forged and fabricated painted steel. 41″ H x 8″ D x 260’L. Naples/Marco Philharmonic Building, Naples, Florida. Door handles, forged and fabricated naval bronze. 24’L x 8’H x 1’D. 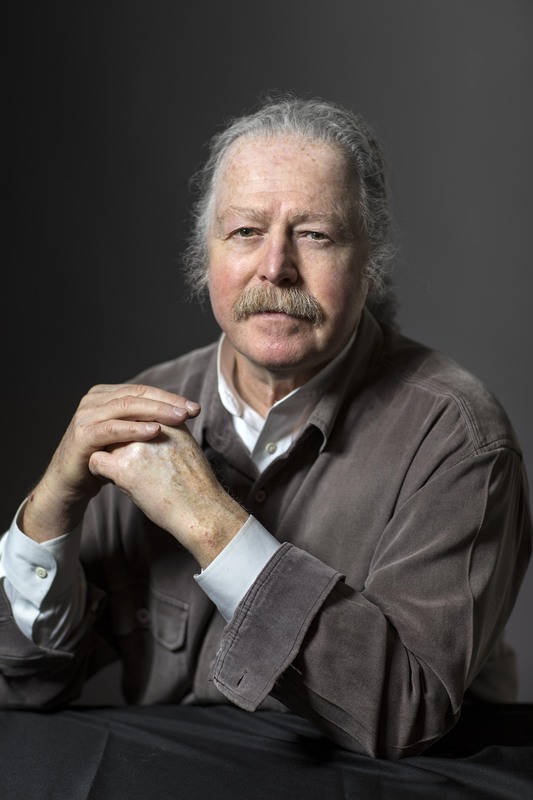 Architect: Eugene Aubry, Aubry Associates. 1988 Cornell University Medical College, Lasdon Biomedical Research Building, New York, New York. Window Screen. interior sculpture. Forged and fabricated steel, painted. 8’W x 6’H x 1’D. Architects: Payette Associates, Boston, Massachusetts. Memorial Art Gallery of the University of Rochester, Rochester, New York. Convergence, interior sculpture. Forged and fabricated steel, painted. 8’H x 6’W x 3’D. State of Connecticut, Bureau of Public Works, for the Hartford Superior Court Building, Hartford, Connecticut. 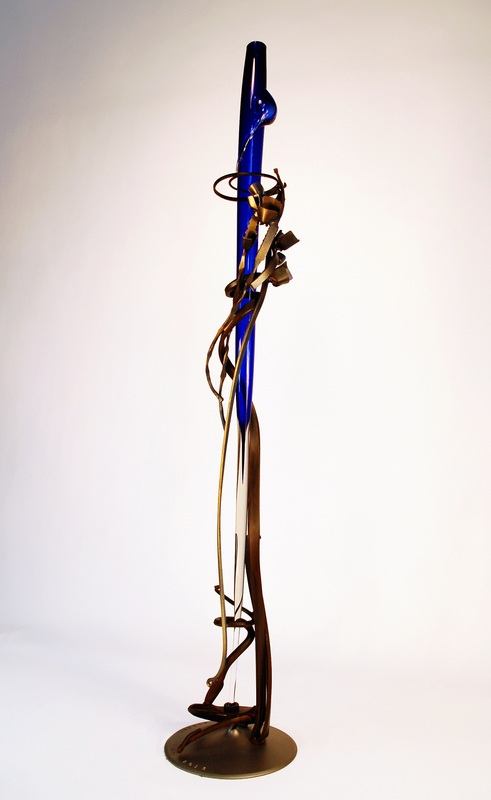 Hexad, interior sculpture, forged and fabricated painted steel, brass. 21’H x 12’D. Washington Hebrew Congregation, Washington, D.C. Two Menorahs, forged and fabricated painted steel. 8′ H x 6’W x 3’D. Flower Stands, forged and fabricated painted steel. 36″H x 26″D. Sconces, cast bronze. 30H” x 18″ W x 9″ D.
Massachusetts Bay Transit Authority, Milk Street Station, Boston, Massachusetts. Entrance Gateway. Forged and fabricated steel, painted. 10’H x 10’W. New York State Council on the Arts, New York, New York. New York State Governor’s Art Awards. Forged and fabricated steel. 18″H x 4″D. The Willard Building, Washington, DC. Interior Sculpture. Forged and fabricated steel and brass. 8’2″H x 5’11″W x 1’6″D; Door Pulls. Cast bronze. 24″H x 19″W x 3″D. Architect: Valstimil Koubeck, Washington, D.C.
1984 Harro Theater East, Rochester, New York. Conclave, exterior sculpture. Formed and fabricated steel, painted. 30’H x 22’W x 10’D. Port Authority of Allegheny County, Pennsylvania for the Light Rail Transit System of Pittsburgh. Poster Cases. Formed and fabricated steel, painted. 8- 1/2’H x 4-1/2’W. 1983 Clyde’s Restaurant, Tyson’s Corner, Virginia. Fountain. 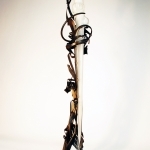 Forged and fabricated painted steel, brass, carved slate, and glass, 13’H x 12’W x 4’D. Frederick Merritt Gallery, Rochester, New York. Entrance Gate. Forged and fabricated steel. 7’H x 6’W. The Hyatt Corporation, for the Hyatt Grand Cypress Hotel, Orlando, Florida. Stair Enclosure. Forged and fabricated steel and brass. 19-1/2’H x 8-1/2W x 7-7/8’D. Quadrangle Development, for the J. W. Marriott Hotel, Washington, DC. Gates. Forged and fabricated steel and brass, 8’H x 6’W; Architectural Screen. Forged and fabricated steel. 5’H x 25’W. 1982 Edward J. Lenkin, Washington, DC. Vehicular Gate. Forged and fabricated steel, painted. 8-1/2’H x 8-1/2’W. Strong Museum, Rochester, New York. Exterior Sculpture. Hollow formed and fabricated Cor-ten steel. 15-1/2’H x 31-1/2’W x 6’D. 1981 Edward J. Lenkin, Washington, DC. Entrance Gate. Forged and fabricated steel, painted. 12’H x 7’W. Pennsylvania Avenue Redevelopment Corporation, Washington, DC. Eighthundred Tree Grates, cast iron, 88″ diameter; thirty Benches, 68″ diameter. 1980 Prospect Place, Washington, DC. Exterior Clock. 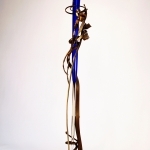 Forged, fabricated and painted steel, brass, and bronze. 13’5-1/2″H x 4’10” D Architects: Metcalf and Associates, Washington, D.C.
New York State Senate, Albany, New York for State Senate Chambers, Capitol Building. Two pair Portal Gates. Forged and fabricated steel, brass, and bronze. 162” H x 108” W x 6” D each. 1979 Clyde’s Restaurant, Tyson’s Corner, Virginia. Pergola, Banisters, and Railings. Forged and fabricated painted steel and bronze; Push Plates for revolving doors. Cast bronze. 1977 Columbia Bank, Gates, New York. Interior Lighting Fixture. Forged and fabricated steel. 10-1/2″H x 7-1/2″D. 1975 Hunter Museum of Art, Chattanooga, Tennessee. Exterior Sculpture CourtEnclosure. Forged and fabricated steel, painted. 6’H – 12’H x 87-1/2’W. 1974 Renwick Gallery, National Museum of American Art, Smithsonian Institution, Washington, DC. Interior Portal Gates. Forged and fabricated steel, brass, and bronze. 90-1/4″H x 72-1/2″W x 4″D. Texas2009 Albert Paley, Grounds for Sculpture, Hamilton, New Jersey.2008 Albert Paley, American Museum of Art, Easton, Maryland.2007 Albert Paley Portals & Gates, Iowa State University, Ames, Iowa. 2004 Albert Paley, Galerie Francoise Et Ses Freres, Baltimore, MarylandThe Artist Responds: Albert Paley and Art Nouveau, Racine Art Museum, Racine, Wisconsin.Albert Paley, Maurine Littleton Gallery, Washington DC. 2002 Imago Galleries, Palm Desert, California (3-person exhibition)Albert Paley: Process, Mint Museum of Craft and Design, Charlotte, North Carolina.Metalworks by Albert Paley, Wexler Gallery, Philadelphia, Pennsylvania. 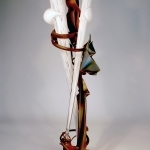 1998 Albert Paley: A Dialogue of Architecture, Decorative Arts and Design, Chicago Design Show, Chicago, Illinois. 1994 Albert Paley: Drawings and Sculpture, Temple Gallery, Philadelphia, Pennsylvania.Albert Paley: Organic Logic, Peter Joseph Gallery, New York, New YorkAlbert Paley: Recent Works, Peter Joseph Gallery: Southampton, Southampton, New YorkInspiration & Context: The Drawings of Albert Paley, Memorial Art Gallery of the University of Rochester, Rochester, New York. 1992 Albert Paley: Recent Sculpture, Samuel P. Harn Museum of Art, University of Florida, Gainesville, FloridaAlbert Paley: Studies for the “Portal Gates”, Renwick Gallery, Smithsonian Institution, Washington, DC. 1991 Albert Paley: Sculpture, University of the Arts, Philadelphia, Pennsylvania and the Naples/Marco Philharmonic Center for the Arts, Naples, FloridaAlbert Paley: 1980-1990, Barbara Fendrick Gallery, New York, New York.Albert Paley: Architectural Metalwork, Hellmuth, Obata & Kassabaum, Washington, D.C.
1997 Albert Paley: Selected Works, Fine Art Society, London, England.Art Expo Chicago, selected work from the Richard Gray Gallery, Chicago, Illinois. 1996 International Jewellery from Europe & USA, Crafts Council Gallery, London, England. 1995 International Metal Arts Exhibition, Won-Kwang University, Iri City, Republic of South Korea. 1994 Jewellery 1964-1994, Selected works from the Helen Williams Drutt Collection, Stedelijk Museum, Amsterdam, the Netherlands.Schmuck Unserer Zeit, 1964-1993 [The Jewelry of our Time], Museum Bellerive Zürich, Switzerland. Museum of Fine Arts, Houston,Texas. 1999 Magic and Ritual: Hannukkiahs seen through contemporary eyes, Stienbaum Krauss Gallery, New York, New York and Miami, Florida. 1995 Bausch & Lomb Art Commissions, The Gallery at One Bausch & Lomb Place, Rochester, NYBreaking Barriers: Recent American Craft, Portland Museum of Art, Portland, Oregon. 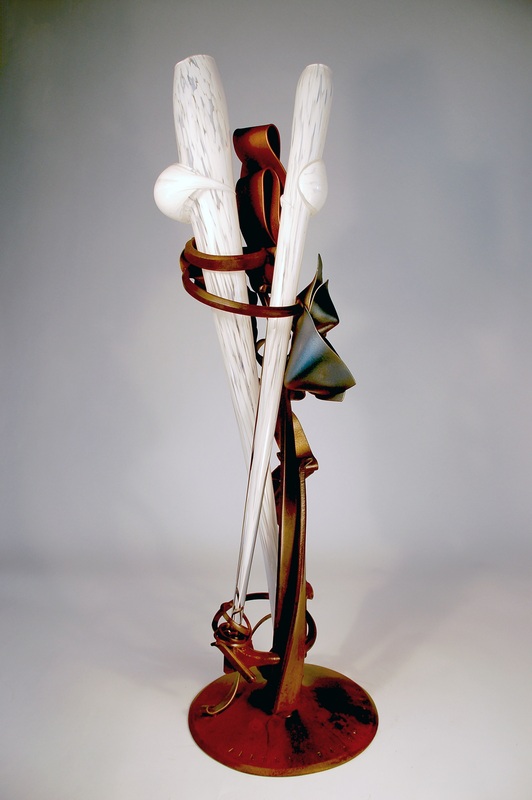 Sammy Peters and Albert Paley, The Bell Gallery, Birmingham, Michigan. The White House Collection of American Crafts, Renwick Gallery of the National Museum of American Art, Smithsonian Institution, Washington, D.C.
1994 A Portrait of a Nation, Greater Reston Art Center, Reston, Virginia.Allusion/Illusion, Florida State University Museum of Fine Arts, Florida.Art Miami ’94, International Art Exposition, Miami Beach Convention Center, Miami Beach, Florida.Dialogues: On and Off the Wall, Peter Joseph Gallery, Schmidt Bingham Gallery and Garth Clark Gallery, New York, New York.Faculty Exhibit, Bevier Gallery, Rochester Institute of Technology, Rochester, New YorkHoliday Exhibition: small works, Peter Joseph Gallery, New York, New York. Lighting by Studio Furniture Makers, Gallery Naga, Boston, Massachusetts. Masterworks Two, Peter Joseph Gallery, New York, New York. Metallic, Northern Michigan University, Lee Hall Gallery, Marquette, Michigan. 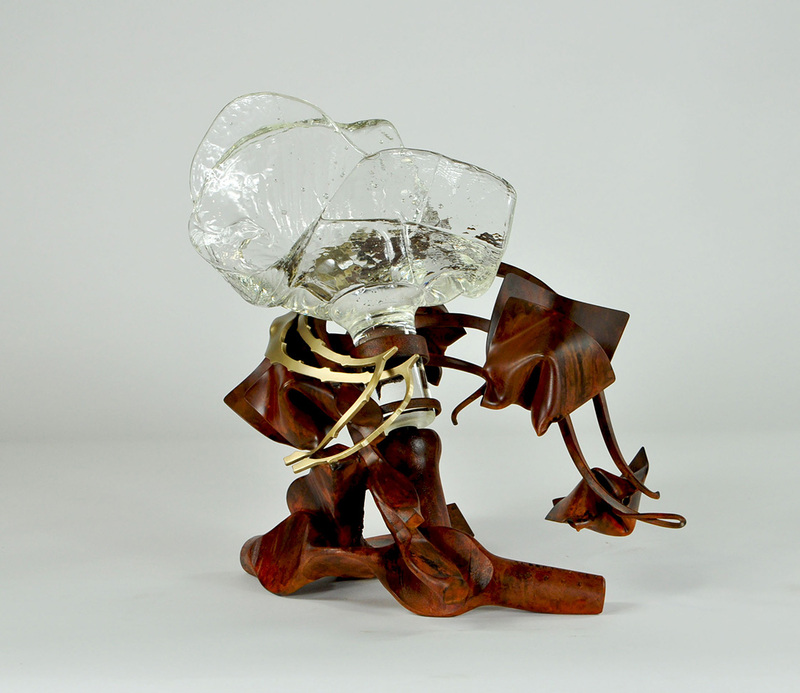 School for American Crafts Continuum Exhibition, Bevier Gallery, Rochester Institute of Technology, Rochester, New York. SOFA 1994, Peter Joseph Gallery booth #215, Sheraton Chicago Hotel & Towers, Chicago, Illinois. Works in Metal, The Wetsman Collection, Birmingham, Michigan. 1993 Art and Application, Turbulence, New York, New York.Chicago International New Art Forms Exposition, Peter Joseph Gallery, Navy Pier, Chicago, Illinois.Collectors Annual Exhibition, Boca Museum, Boca Raton, Florida.Contemporary Jewellery, 1964-1993, Selected Works, Helen Williams Drutt Collection, The Arkansas Arts Center Decorative Arts Museum, Little Rock, Arkansas.Formed by Fire, The Carnegie Museum of Art, Pittsburgh, Pennsyvania.Furniture Fantasy, Susquehanna Art Museum, Harrisburg, Pennsylvania. Modern Metalwork in the Metropolitan Museum of Art, Metropolitan Museum of Art, New York, New York. Our Public Image, H. and W. Bechtler Gallery, Charlotte, North Carolina. 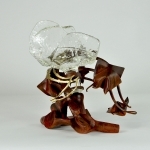 Year of American Craft, Brunnier Art Museum, Iowa State University, Ames, Iowa. 1992 Eccentric Furniture + Objects, Gensler and Associates Architects, San Francisco, California.Patterns and Layers, Schick Art Gallery, Skidmore College, Saratoga Springs, New York.Revolving Techniques, James A. Michener Art Museum, Doylestown, Pennsylvania. 1991 Collecting American Decorative Arts and Sculpture: 1971-1991, Museum of Fine Arts, Boston, Massachusetts.Contemporary Furniture Makers of the American Northeast, The Gallery at Bristol-Myers Squibb, Princeton, New Jersey.Finger Lakes Companion Show, Memorial Art Gallery of the University of Rochester, Rochester, New York.Furniture as Art, Art Gallery, Montgomery College, Rockville Campus, Rockville, Maryland.Sculpture ’91, Monroe County Parks Department, Highland Park, Rochester, New York. 1990 A Decade of Craft, American Craft Museum, New York, New York.Art Against Aids, Washington, DC.Art for Everyday, Snyderman Gallery, Philadelphia, Pennsylvania.Art that Works: Decorative Arts of the Eighties, Crafted in America, National Traveling Exhibition, 1990 – 1993, Art Services International. Ball State University, Muncie, IndianaSculpture 90, Fendrick Gallery, Washington, DC. 1988 Architectural Art: Affirming the Design Relationship, American Craft Museum, New York, New York. Oklahoma City Art Museum, Oklahoma City, OklahomaPublic Art: Making a Better Place to Live, Tower Fine Arts Gallery, State University of New York College at Brockport, Brockport, New York.Masters of American Metalsmithing, organized by the National Ornamental Metal Museum, Memphis, Tennessee. Exhibited at Schering-Plough Corporation, Madison, New Jersey. 1974 Baroque ’74, Museum of Contemporary Crafts, New York, New YorkCarburum Museum, Niagara Falls, New YorkCollectors, Museum of Contemporary Crafts, New York, New York. Cooper-Hewitt Museum of Decorative Arts and Design, Smithsonian Institution, New York, New YorkEmbody Art, Helen Drutt Gallery, Philadelphia, PennsylvaniaForm ’74, Northern Illinois University, DeKalb, Illinois*Goldsmith ’74, Renwick Gallery, Smithsonian Institution, Washington, DC, and the Minnesota Museum of Art, St. Paul, Minnesota. Purchase Award. *1972 Rochester Finger Lakes Exhibition. Memorial Art Gallery of the University of Rochester, New York. Las Vegas Art Exhibition, Las Vegas Art League, Las Vegas, Nevada. *Southern Tier Arts and Crafts Show, The Corning Museum of Glass, Corning, New York. Jurors’ Award. Tyler Directions ’71, Temple University, Tyler School of Art, Alumni Association, The Philadelphia Civic Center, Philadelphia, Pennsylvania. *Sterling Silver Competition, Sterling Silver Guild, New York, New York. Honorable Mention. 1966 *Contemporary Crafts for Christmas, Wilmington Society of FIne Arts, Wilmington, Delaware. Museum Purchase Prize. *Craftsmen ’66, Wilmington Society of Fine Arts, Wilmington, Delaware. National Mert Award. *Craftsmen USA, Museum of Contemporary Crafts, New York, New York. Merit Award. 1965 *American Jewelry Today, Scranton, Pennsylvania. Honorable Mention.Camden County Art Exhibit, Pennsauken, New Jersey.